STERLING SILVER & ENAMEL MECHANICS STERLING Co.
*RARE* Antique MECHANICS STERLING CO. (hallmark STERLING) ZODIAC JUNE CANCER 69 sterling and enamel spoon. Measures 4 3/4" in length. The Mechanics Sterling Co. was located in Attleboro, Mass and began production in 1896 and was in business for a short time before being absorbed into a larger silver company. No chips, cracks or repairs. STERLING SILVER 925 DAVID ANDERSON hallmarked PLIQUE A JOUR & CHAMPLEVE gold washed on sterling berry spoon. Measures 6 1/2" in length. There are a very few small flakes to the multicolored champleve enamel work on the reverse side of the bowl. Marius Hammer (Bergen @ 1847-1927) PLIQUE A JOUR 900 SILVER & GOLD plate spoon. Hallmarked on the MH 900. Measures 4 1/2" in length. No chips, cracks or repairs. *RARE* J. TOSTRUP of Oslo Norway PLIQUE A JOUR and 830 continental silver torch liberty handled spoon. Engraved Bergen in the interior of the spoon's bowl. Liberty torch design makes this a must have for any spoon or plique a jour or silver collector. Measures 4 1/2" in length. Hallmarked "J.T.830. No chips, cracks or repairs. 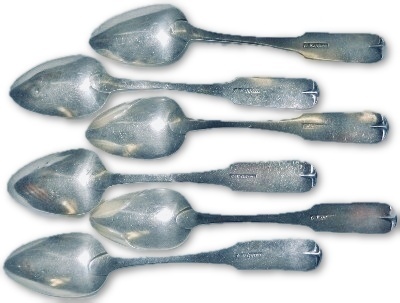 American Silver master salt spoon. Unmarked, we believe this item is Coin Silver, circa 1800's. Measures 3 3/4" long. The reverse side is gently worn. No damage to this wonderful item. American Coin Silver circa 1854 wreath pattern master salt spoon by Joseph Seymour. Joseph Seymour of Syracuse NY was in business from 1835-1887. Measures 3 7/8" long and is hallmarked on the reverse side of the handle. No damage or repairs. American Coin Silver shell master salt spoon. This item is impressed on the reverse side of the handle "NEWTON & KIMBALL P *". Monogrammed MED. Measures 3 5/8" long. No damage or repairs. PAIR of C WHILES BURMINGHAM "A1"master salt spoons. Measure 4 1/4". Stamped G C W and two hallmark devices. No repairs. 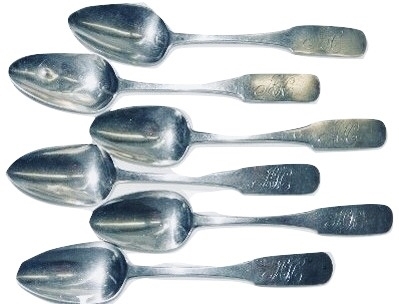 American coin silver table spoons (6) in the Fiddle pattern by George Kippen, Bridgeport, Ct. (1790-1847). This matching set of tea spoons measure 5 7/8" long and weigh between 2.0 and 2.1 grams. Each spoon is monogrammed with ornate AH. One spoon has a small ding as shown in the images (shown front and back images), which can be easily removed. There appears to be normal age use wear/scratching and possible very early handle reinforcements etc. ANTIQUE Meriden Cutlery Company Sterling silver and elk horn carving set. The company name and logos are impressed in the blade of the carving knife which shows a century of wear and discoloration but is still in very good usable condition. The Sterling silver bands between the plated carving hardware is marked STERLING as is the STERLING end plate of each of the real elk horn handles. The carving knife measures 14" long and the fork measures 11" in length. This is a beautiful set and will make any holiday meal more special. Other than the discoloration and a little expected rusting to the knife blade there is no damage or repairs.